When Avacyn Restored came out, I ventured out into the world of playing EDH at local game stores I was unfamiliar with. Reliably, when discussing colour strengths, Red would be cited as the weakest. While Red is commonly seen as the worst of the mono-colour choices available, I believe white the weakest, for the sheer difficulty it faces drawing cards. Red at least has a handful of Wheel of Fortune effects that can be relied upon to rejuvenate retrenched casters. White, for all its versatility in removal and other features, lacks steady and reasonable card draw, except from artifacts. This week, I’m going to go over a mono-white deck. Moreover, it’s going to be a control deck, which are best known among the three pure archetypes – aggro, combo, and control – for the need to gain card advantage over their opponents. Next week, I’ll write about a different kind of mono-white control deck that uses unorthodox tricks to gain card advantage and maintain control. Will these decks win every game? Probably not, but they will run across opponent’s expectations and will surprise your friends. So, what’s a mono-white player to do? Read on. If you’re not terribly familiar with deck archetypes, they generally come in three flavours: aggro, control, and combo. Typically, a control deck tries to stall the game long enough to leverage an unstoppable threat, usually costing a significant amount of mana. To stall for that long, a control deck finds ways of getting the most out of each card they draw, and drawing extra cards to deal with all the threats that present themselves. Something like Man-o’-war is ideal; it delays a creature’s attack for a turn, forces an opponent to recast the bounced creature in lieu of other spells, and then can block, possibly taking another creature with it. Contrast this with aggro, which eschews long-term planning in terms of card advantage, life or mana for quick damage leading into quick wins. A popular card in aggro would be Fireblast, which sacrifices long-term use of mountains to fire off winning damage early, or my personal favourite, Kaervek’s Spite which throws everything away for that last bit of damage. Control is often associated with blue, by reason of counterspells, or occasionally black, for the plethora of creature and hand denial available. Mono-white control has minimal disruption for instants and sorceries, and no hand denial to speak of. Further, a conundrum for control in Commander is that all archetypes play splashy spells well into the high-mana range, and few players really take the aggro route, preferring to pace themselves against a whole table of expanded life totals. Control in Commander will be more about shutting out any game-ending threats while building up resources for one very difficult to stop threat that will hopefully deal with players rapidly. Further, since white has nearly none of the traditional control mechanisms, new ways of keeping the game in check need to be developed. First, mono-white control needs a colossal finisher. Since we’re talking about EDH, and being able to recur a threat is important, we might as well make our general the thing to win. It also helps that general damage is a thing players can lose to, making a threatening commander more efficient. 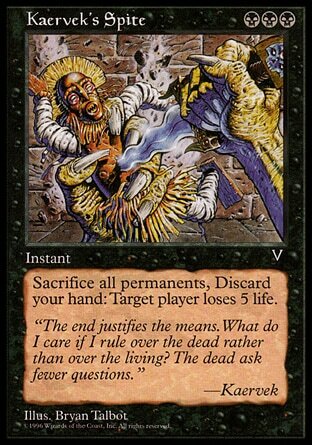 Additionally, a win through general damage effectively nullifies the any life gain from cards like Swords to Plowshares. My first choices for this are Akroma, Angel of Wrath or Avacyn, Angel of Hope. Each of these comes with their own advantages; Akroma is difficult to deal with because of native protections, has a few modes of evasion, and gets into the red zone quickly with haste. The trample and protections can often be key; opponents, if they can block, will suffer trample damage which will increase with cards like Strata Scythe or other pieces of equipment. Further, with the cumulative protection between native protections and further enhancements like Cho-Manno’s Blessing Shield of Duty and Reason or Sword of Body and Mind, Akroma can effectively become untargetable or unblockable. Avacyn, on the other hand, is arguably more difficult to answer. While she lacks the native evasion Akroma has, Avacyn has an 8/8 body which allows her to eliminate a player in three successful hits, and protects each other permanent you control, allowing persistent control permanents to stay around longer. This also provides a virtual card advantage; players find themselves generally unable to use destroy effects against you, effectively blanking those spells. 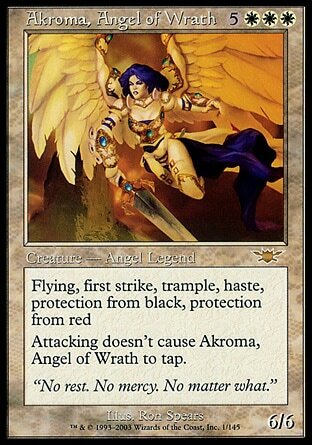 My personal preference is for Akroma, since the evasion is often highly relevant, she effectively disables most black and red creatures and spells, and partly for nostalgic reasons. There are other options for combo finishers in mono-white, specifically involving Reveillark and Karmic Guide. I tend to not run these because I find them unsatisfying, but they are available for the less squeamish. The next obvious sticking point is card advantage. White is renowned for being lousy at drawing cards. 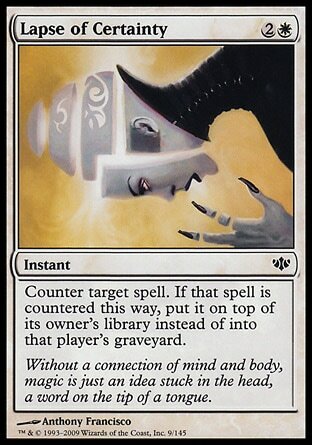 Few cards in white even have the word ‘draw’ without falling into the ‘cantrip’ class of spells. White traditionally gains its card advantage from asymmetric board states, and its many sweepers, like Wrath of God. If you have one creature out, and your opponents have many, Wrath of God produces card advantage by costing you only two cards, and costing your opponents more. If you face a lot of decks that have a talent for gaining a lot of card advantage or ones that lay out a lot of land quickly, Balancing Act is a perfectly viable card to deal with them. Austere Command is another card that will often destroy far more of an opponent’s permanents than the player casting it. Additionally, there are a few engines like Land Tax with Scroll Rack, For mono-white control, this probably will not be enough. Just as choosing Akroma or Avacyn as your general creates virtual card advantage by rendering some of your opponents’ spells useless, many white cards create ‘rules’, disallowing players from taking certain actions. My favourites of these are Rule of Law, Angelic Arbiter, Angel of Jubilation, Linvala, Keeper of Silence, Aven Mindcensor, and Stony Silence. There are dozens of ‘no you may not’ effects available in white, all of which narrow your opponent’s options to fight against you, as you pummel them with Akroma or Avacyn. Finally, the direct control spells. Lapse of Certainty, Dawn Charm, Seht’s Tiger, Rebuff the Wicked, and Eight-and-a-Half-Tails all allow you to afford some protection from spells that slip through the net of rules your other cards create. If a destruction spell is successful, or you find yourself on the bad end of a sweeper, Second Sunrise or Faith’s Reward can restore everything to normal in short order. If you find yourself artifact and enchantment heavy, Open the Vaults is another way of restoring everything to order. The preceding set of design principles are fairly traditional. There are a few finishers, one of which is the general. We get actual card advantage from sweepers and virtual card advantage from ‘rules’ cards. We also generally even the board by bringing everyone down to speed, until we can drop a big finisher and beat players down. Of course, none of this is set in stone. Your general need not be a finisher, and could be a control element on its own, like Linvala, Keeper of Silence, Mageta the Lion, or even Mangara of Corondor. Moreover, there is a whole set of cards that deal with tempo, like Hokori, Dust Drinker and Thalia, Guardian of Thraben which try to limit opponents’ options by forcing them to spend more mana for their threats than your answers. Hopefully this has been an enlightening article on the nature of control and mono-white Commander decks. Next week, we’ll look at a more aggressive control list, with Odric, Master Tactician at the helm.